Front Porch Republic Books, 9781532638091, 224pp. Wendell Berry thinks of himself as a storyteller. It's somewhat ironic then that he is better known as an essayist, a poet, and an advocate for small farmers. The essays in this collection consider the many facets of Berry's life and work, but they focus on his efforts as a novelist and story writer. Indeed, Berry had already published three novels before his seminal work of cultural criticism, The Unsettling of America, established him as an ardent defender of local communities and sustainable agriculture. And over the past fifty years, he has published eight novels and more than forty-eight short stories set in the imagined community of Port William. His exquisite rendering of this small Kentucky town challenges us to see the beauty of our own places and communities and to tend their health, threatened though it inevitably is. 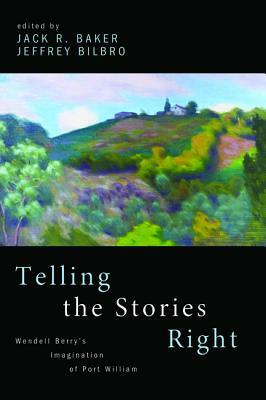 The twelve contributors to this collection approach Berry's fiction from a variety of perspectives--literary studies, journalism, theology, history, songwriting--to shed light on its remarkable ability to make a good life imaginable and compelling. The first collection devoted to Berry's fiction, this volume insists that any consideration of Berry's work must begin with his stories. ""The next best thing to reading Berry is to read those who write about Berry's writing. We should be extremely grateful that we now have this collection of wise investigations of Berry's novels and short stories. These essays do what they were meant to do which is nothing less than celebrate Berry's fertile imagination."" --Stanley Hauerwas, Professor of Divinity and Law at Duke University ""When I encounter readers, who share Wendell Berry's concerns but are unfamiliar with his work, I urge them to begin with his fiction. One finds there, more fully arrayed than in his essays or poetry, the web of relationships connecting persons, place, and community. The weaving of that web, on the page and in the world, is the subject of the dozen studies in this book, a worthy guide to the storytelling art of an essential author."" --Scott Sanders, author of Earth Works: Selected Essays Jack R. Baker is an Associate Professor of English at Spring Arbor University. He and Jeffrey Bilbro have previously co-authored Wendell Berry and Higher Education: Cultivating Virtues of Place (University Press of Kentucky, 2017). Jeffrey Bilbro is an Associate Professor of English at Spring Arbor University. He is the author of Loving God's Wildness: The Christian Roots of Ecological Ethics in American Literature (University of Alabama Press, 2015) and Practice Resurrection: Wendell Berry and the Virtues of Sustainable Forms (forthcoming from University Press of Kentucky).